What is carob | Australian Carob Powder | Wholesale Carob | The Australian Carob Co. There are male carob trees, female carob trees and hermaphrodite carob trees. Male trees only produce flower for pollination of the female trees and the male trees will never produce any carob pods. 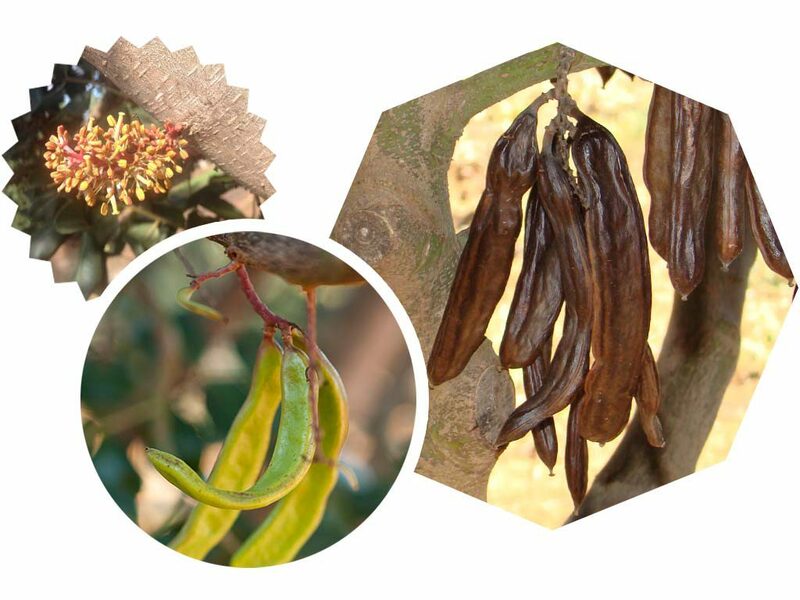 Female trees produce carob pods and need the pollination from either a male flowering tree or a hermaphrodite flowering tree. Hermaphrodite trees produce both male and female flowers, so it can pollinate it’s self to produce carob pods and also pollinate other female trees close by. There are many different varieties of carob trees and we only selected varieties to plant based on the taste of the carob pods. Carob contains many health benefits, which depending on how the plant is prepared, can be used as a natural remedy for human health issues. The pod consists of three different parts; the outer husk, the nutritive endosperm and the inner seed. Contain tannins that are rich in gallic acid. Gallic acid provides anti-allergic, antiseptic and anti-bacterial benefits. Contain Thiamin (vitamin B), Riboflavin (vitamin B2), Niacin (vitamin A), alpha-tocopherol, and ergocalciferol (vitamin D2). Full of antioxidants and phytonutrients. High in potassium and magnesium. 100% natural with no chemicals or preservatives. According to livingstrong.com, eating carobs regularly can aid in the management of digestive health. The tannins found in carobs can increase the effectiveness of certain substances (enzymes) that help to regulate the digestion process. Additionally, carob provides powerful anti-viral benefits that supply the body with essential antioxidants. Foods rich in tannins are often recommended for treatment of diarrhea as it reduces acid production and combats related ailments. Due to the high percentage of insoluble fibre contained in carobs, research shows carobs have the potential to lower cholesterol levels. Carobs have naturally high levels of lignin and polyphenols, which are powerful antioxidants. to stomach acids and cholesterol in order to help them pass through the body and be excreted. Experts say carobs contain fibre that naturally helps to regulate blood sugar levels (useful for people who suffer from diabetes). 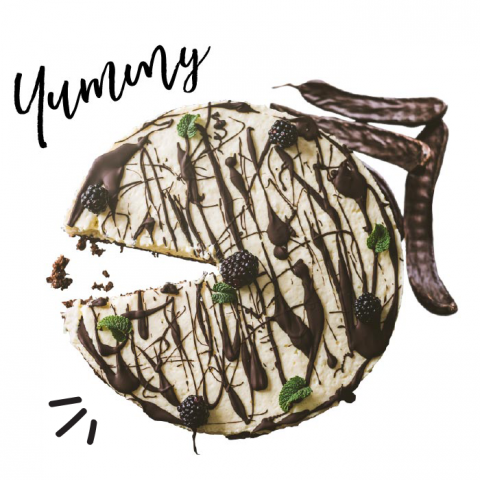 As an insoluble fibre product (which contains pinitol, a type of inositol), carob helps water bind in the digestive tract, which enhances the health of the intestinal tract and regulates blood glucose. In a clinical trial conducted in the US, consumption of a carob pulp preparation decreased postprandial responses of acylated ghrelin, triglycerides, suggesting a change toward increased fatty acid oxidation. In other words, carob fibre might exert beneficial effects in energy intake, and thus, reduce body weight. Carob is high in phosphorus and calcium, which means it may help in the fight against osteoporosis ailment. It has also been recommended for children who have had polio ailment, due to the high levels of calcium and gallic acid. As carobs are rich in vitamin E, and full of antioxidants and phytonutrients, they have, on occasion, been suggested in aid of the treatment of anemia, coughs, osteoclasis, colds and influenza. Carobs also contain Gallic acid that provides anti-allergic, antiseptic, and anti-bacterial benefits. In some rare cases, experts have suggested carobs be used to help reduce the changes of patients with lung cancer. Improves digestion (may help obesity). Contains vitamins A, B1, B2, B3, D and E and is used for the treatment of cough, flu, amemia and osteoclasis. May help to prevent lung cancer, if used regularly.